These are by no means an everyday indulgence, but sometimes, you just want a cupcake. 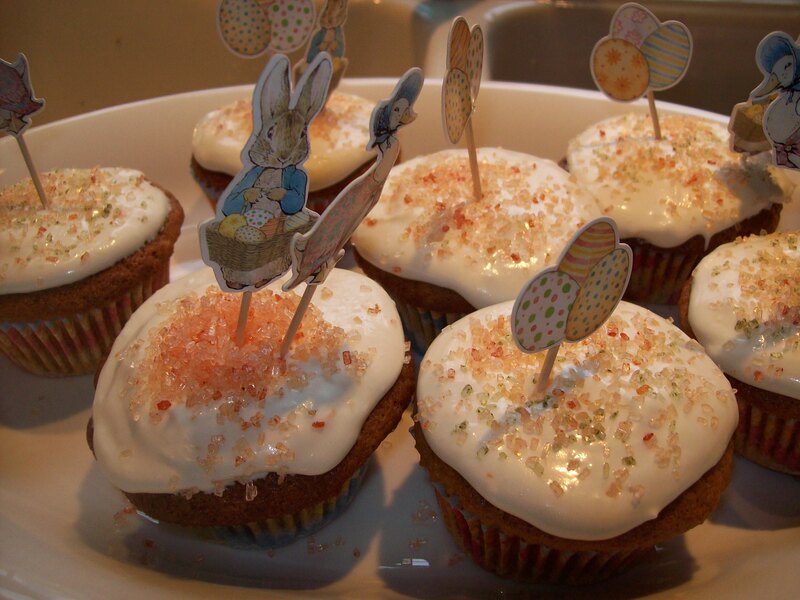 I invented this particular recipe in response to my boys’ insistence one year that carrot cake was the only logical dessert with which to end our Easter meal. The cupcakes are light, fluffy, moist, and they freeze beautifully (unfrosted). Preheat your oven to 400 degrees. Lightly grease or line 2 dozen muffin tins. In a large bowl, beat together the butter, sugar, maple syrup, yogurt, eggs, and vanilla until smooth and creamy. In a separate bowl, combine the flour, baking soda, baking powder, salt, cinnamon, and nutmeg. Gradually add the dry ingredients to the wet, mixing just until everything is thoroughly combined. Gently fold in the carrot, raisins, and pecans. Scoop the batter into the prepared muffin tins and bake at 400 degrees for 15-20 minutes, until a toothpick inserted into the center of a cupcake comes out clean. Allow the cupcakes to cool completely before icing. This icing recipe employs a secret trick I learned years ago from my grandmother: Using sweetened condensed milk as a base for icings gives the smooth, creamy consistency so many of us are used to from the ready-made frostings sold in grocery stores. You can buy higher-quality organic sweetened condensed milks in many stores. Using an electric mixer, beat together the sweetened condensed milk, butter, and cream cheese until smooth. Add the vanilla, salt, and orange zest and mix well. Slowly and gradually add the confectioner’s sugar, until you’ve reached the desired consistency for your icing. If you have extra icing left after you’ve frosted your cupcakes, this icing will last in an airtight container in the refrigerator for up to a month.